As part of the GAF Designer Series, the Camelot® line of shingles offers beauty and function that is unparalleled. 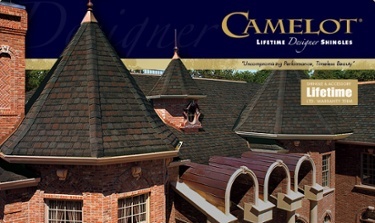 "Combining uncompromising performance with timeless beauty, Camelot® may be the finest designer asphalt shingle ever made." With a limited, lifetime warranty, you have piece of mind that your investment now will hold up over the years to come. A warranty is only as good as the party who installs the product. With Berkeley Exteriors, you know the job will be done right. Berkeley Exteriors has been installing GAF roofing materials and other roofing products since 1992. We are certified roofing contractors with GAF - so you know we meet the highest quality standards. We're a locally-owned and managed company, not a seasonal contractor, and we employ a full-time installation team, many of whom have more than 10 years experience with us. We think it's a tribute to our commitment to getting the job done right that nearly 75 percent of our business comes from referrals by satisfied homeowners.